Can this little dynamic microphone do the business? It doesn’t come cheap, but the AE2300’s attractive design, compact footprint and supreme build quality make it an incredibly desirable instrument mic for both live and studio use. Tailored frequency response with mid and high boosts. Optional low-pass filter to help curtail excess high frequencies at source. Rubberised screw tight clip for secure mounting. Reasonably pricey for a dynamic mic. Small size precludes use as a handheld. 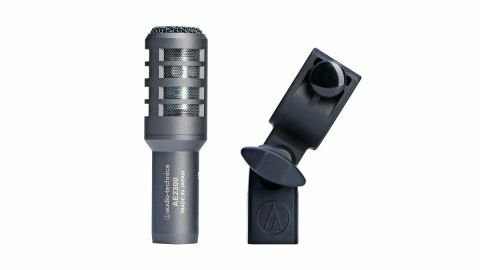 The Audio-Technica AE2300 is a cardioid dynamic instrument mic and the latest addition to Audio Technica’s long-established Artist Elite series. In terms of design, it’s not as fancy as its own dual capsule instrument mics (the AE2500 and ATM250DE), but is better equipped than their regular ATM250 or ATM230 instrument dynamics, as reflected in the mid price point. The AE2300 is a broad-application high-SPL cardioid design, so should be ideal for percussion, drums, guitar amps and brass. It’s also pretty compact (less then 10cm long), so is perfect for discreet use in a live environment. The weighty brass casing and top grille feel robust, and the screw-tight rubberised clip should see off any wandering drum sticks while providing some mechanical isolation. Overall, it’s a beautifully designed and manufactured mic. The proprietary double-dome diaphragm improves high-frequency and transient response. The off-axis frequency response is also reasonably linear up to 120 degrees, and not bad even at 180 degrees off-axis, which could certainly be beneficial when setting up a multi-miked drum kit. Sonically, the AE2300 is voiced to provide a mid-to-high-presence lift peaking just above 5kHz, and also has a small ‘air’ lift at around 14kHz. In practice this is great on both percussion and drums, bringing out the attack, and on the face of it does a similar job to a Shure SM57. Nevertheless, we put the two mics up side by side and the AE2300 sounds more precise in its midrange lift while capturing more high frequency ‘air’, and overall on exactly the same instruments they do sound noticeably different. The AE2300 also has more going on in the low frequencies than an SM57, and only shows noticeable tail off from about 80Hz. This makes it great for capturing the full frequency of lower pitched toms for example, and on an electric guitar cab those low frequencies are also very welcome, even if one chooses to curtail them later. It has more going on in the low frequencies than an SM57, and only shows noticeable tail-off from 80Hz. There are situations where the extended high-frequency response may not be ideal, and with that in mind, the AE2300 also includes a switchable 6dB/octave low-pass filter. This is set at 6kHz, which does a good job of sucking the life from percussion. Even so, in a lively recording space, or if you’re trying to minimise high-frequency spill (cymbals and hi-hats for example), it’s great to have the option. We even found that the low-pass filter worked quite well on a guitar cab, as it shifted the focus slightly more into the midrange. no maintenance requirements, so it should provide good value in the long run.